40% of the world’s population relies on fish as its primary food source, but each year, fishermen return over 7 million tons of unmarketable fish, dead, to the sea. Many current fishing techniques are not selective, leading to juvenile or endangered fish being caught. But when fishermen and designers go hand in hand to find solutions to bycatch they find ways to improve sustainability through selectivity. The World Wildlife Fund estimates that 40.4 percent of global fish catches are made up of unwanted fish, dolphins, whales and birds that are killed by gillnets and trawlers every year. Local fishermen dump approximately 1 million tonnes of dead fish back into the Atlantic North Sea every year. This “bycatch” is often the result of hauls exceeding the European Union’s fishing quotas, but it is also due to unwanted creatures being caught up in the nets. They can be anything from fish too small for commercial sale to species too endangered to be legally retained. Most of them die in the process. In 2008, the situation spurred Scotland’s Fisheries Minister, Richard Lochead, to tell a gathering of industry leaders, “I am appalled and frustrated at the scandalous level of waste and the economic and environmental madness discards represent. In what other industry would it be acceptable to throw away so much of what is produced?” Bycatches have always been a part of the commercial fishing industry, but overfishing and other man-made risk factors have led some to rethink the old methods of doing business. A new generation of innovators is hoping to reduce this yearly bycatch by building smarter fishing nets. Dan Watson is a British designer. His invention, SafetyNet, allows younger fish to escape trawling nets while ensuring the mature ones stay inside. This selective trawling is achieved via fitted LED rings that blink to guide the smaller fish to openings in the net. A larger mesh panel in the bottom of the net also allows “nontarget” bottom-dwelling species to escape through bigger holes. Christopher Brown, a fisherman and board president of the Seafood Harvesters of America, has also designed a net that reduces bycatch. Intended for catching squid, this net contains an escape route for bottom-dwelling fish like flounder. “We need to look at things entirely differently than we have in the last 30 years,” he says. “It’s a matter of enlightened self-interest.” That self-interest includes preserving fishing populations, not only for food but also for the good of the ocean ecosystem. Experts warn that, if commercial fishing trends continue, fish could virtually disappear from the oceans by 2050. “The way we catch now is to catch everything, decide what we want to keep, and discard the rest,” said Martin Hall, head of the bycatch program at the Inter-American Tropical Tuna Commission, which regulates tuna fishing in the eastern Pacific Ocean. To change the tide of unsustainable fishing practices, some designers have jumped in with unique designs to prevent bycatch and overfishing. Inspired by an incident of Scottish fisherman exceeding the European Union catch quota and dumping back five metric tons of dead fish back into the North Sea in 2008, a British designer Dan Watson has come up with LED fish nets. 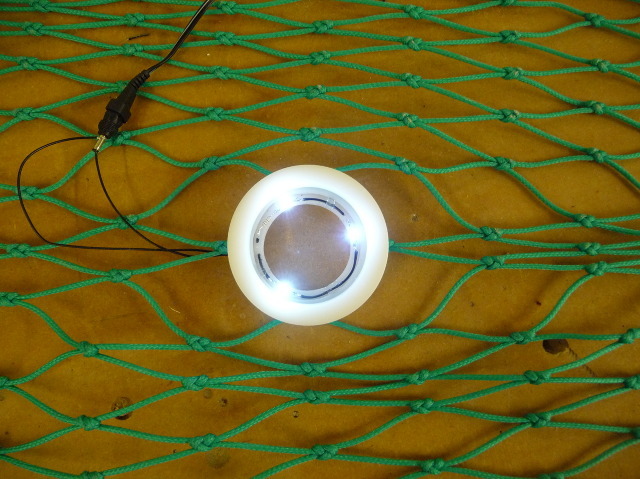 The LED fish net with its large light hoops alert smaller fish and allows younger fish to escape from the net, said Watson. Fisherman are also increasingly recognizing the importance of using better gear, such as fisherman Christopher Brown from Massachusetts, U.S. Brown designed a squid net type fishing net, which has an escape route at the base of the net to encourage unwanted bottom-dwelling flounders to flee from the gap. Top: The LED used in the net up close.Bottom:The fishing net cast under water. Globally, thousands of sea turtles are often snared and drowned by fishnets because they are invisible underwater, said John Wang, project leader and a researcher with the Joint Institute for Marine and Atmospheric Research who works as a fisheries research ecologist at the National Oceanic and Atmospheric Administration. Wang’s team has found LED lights fixed onto nets under a certain wavelength made visible to turtles, could prevent sea turtles from being ensnared by fishing nets. With the new tool, bycatch was reduced by 60 percent during trials in Mexico, Peru, and Indonesia. Wang’s research team has found different light wavelengths tend to affect fish differently, and is currently working on using UV illuminated nets to keep hammerhead sharks away. However, it still all boils down to economics, and whether the nets are going to be affordable enough for fisherman to use on a daily basis. The World Wildlife Fund has regularly hosted the International Smart Gear Competition to encourage dialogue between designers and researchers, and offering prize money as cash incentives for project funding. This year the funding has reached US $65,000 with US $30,000 set aside for the winner. 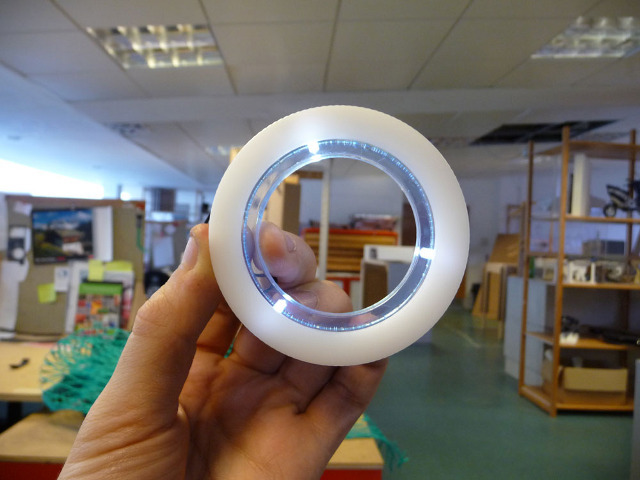 When this news reached Dan Watson, a young British designer, it became the inspiration for SafetyNet, an ocean fishing net that allows certain fish to escape via lighted rings, offering more catch selectivity. The Scottish fishermen’s predicament, he believed, was driven by their lack of control. “There can be no villains, there can be no victims, there are just problems,” Watson says. 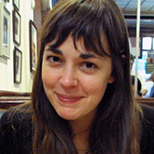 “I started this project because I wanted to go some way towards solving that problem. ” Watson joins a growing number of innovators designing more selective fishing gear to reduce bycatch — the unwanted fish, dolphins, whales and birds that get scooped up by longlines, gillnets and trawlers each year and then discarded. Globally, the amount of marine life that is wasted or unmanaged — which makes it potentially unsustainable — forms about 40% of the catch. “The way we catch now is to catch everything, decide what we want to keep, and discard the rest,” says Martin Hall, head of the bycatch program at the Inter-American Tropical Tuna Commission, which regulates tuna fishing in the eastern Pacific Ocean. Bycatch can result in overfishing, reduces the population of species that might already be endangered and, on the largest scale, interrupts food chains and damages whole ecosystems. It also amounts to an enormous waste of valuable fish protein. To designers building better nets and lines, bycatch isn’t viewed as an inevitability, but as something we can phase out, piece by piece. It’s also seen as a battle that needs to be fought alongside fishermen, not against them. This collaborative environment has delivered some serious successes. In 2011, designers hacked LED fishing lights ordinarily used to attract fish and repurposed them to drive turtles away instead. Globally, dense pockets of gillnets unintentionally snare and drown thousands of turtles each year because they’re almost invisible underwater, says John Wang, project leader and a researcher with the Joint Institute for Marine and Atmospheric Research who works as a fisheries research ecologist at the National Oceanic and Atmospheric Administration. But if LED lights are fixed onto nets and tuned to a wavelength turtles can see, turtles recognize the nets as barriers and cruise by. As Wang puts it, “We have a selective communication channel to the turtles.” With this tool, they’ve reduced bycatch by up to 60% during trials in Mexico, Peru and Indonesia, and are now working with US fisheries too. It’s not just about turtles, though: “What we’re beginning to see is that the wavelength has some interesting properties. Different wavelengths affect fish in different ways,” Wang says. Now, he’s working on illuminating nets with ultraviolet light to steer hammerhead sharks away. The brainchild of fishermen, designers and academics — ”a real collaborative effort,” says Laura Skrobe, Eliminator team member and fisheries scientist at Rhode Island University — the net frees down-swimming cod through the large mesh at the base, reducing bycatch by 80%. A tighter mesh at the top herds in haddock, which tend to swim upward. The net also significantly cuts dogfish, plaice and lobster catch — all without hurting the haddock fishery. 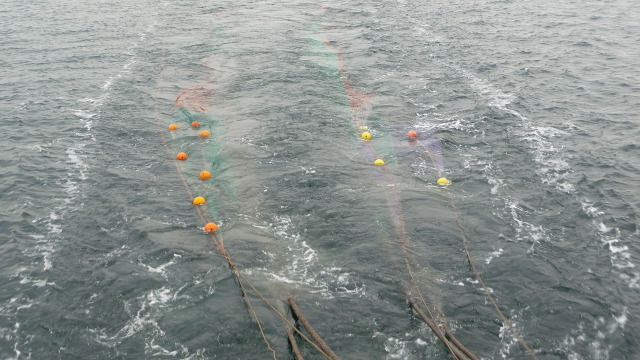 During trials, the team had to sell the catch from the first three trawls just to afford the fourth. But despite hurdles, “the fishermen were really the ones who pushed it,” says Skrobe. “Our fishermen will be conservationists themselves whether or not their managers tell them to. We’re just providing tools for the toolbox.” The net’s straightforward design has made it useful in both the US and the UK, where it’s now formally part of fishing regulations. In August, Dan Watson will try his SafetyNet on the open ocean for the first time. After weathering a few challenges, he’s found a trawler that will take him off the southwestern coast of the UK and into the Atlantic, pulling his lighted net, to ride the swells just as those Scottish fishermen did six years ago.